I would like to start this by saying that the ONLY reason that I started this project was to save the integrity of the HSC, and to come to the defense of the real hardware users. It has come to my attention that there is a less than honorable player among us. This would have not been noticed had it not been for a Game 17 score presented by this individual. It has since been proven by video means that this score is impossible to reach on this game by legitimate means. I would also like to state that I brought this matter up with the moderator of Season 5 HSC privately with no action taken or any communication other than he acknowledged my sentiments. I also suggested amending the 7800 HSC rules with a video submission only by those using emulators..but that was rejected and after further consideration I can see where that would be a tedious process for something that is supposed to be fun...but when the season has been tainted it is no longer is fun. I have included a pdf file of a spreadsheet that I constructed of the entire season thus far minus Fatal Run due to not being completed at this time. I have also included my own personal opinions of this persons score submissions...but I implore everyone of you to form your own opinions. I wish for you to understand that I have no "sour grapes" issue here...just looking for integrity. I know that I am a relative new comer to this HSC...but I assure you that I have been playing video games since the Atari 2600 was made public and am an avid 7800 fan. I am glad that I found this venue for 7800 fans like yourselves and am sorry to see PacManPlus leave us. He gave the community a new life and many games that are a labor of love. but I digress. When I see a score that looks like it is too good to be true...I question it in my mind then I set out to see if the said score is plausible given the parameters set forth by the moderator. I am not saying that I am an expert on all 7800 games.. but there are other avenues of research available to each and everyone of us to use (the Internet). I am sure that there are those that are experts on certain games and certain types of games and I challenge those who are experts of certain games to chime in with your findings. I am also sure that many of you out there question these score submissions as I do and wish for solid validation. If this gets me banned from this venue .. then so be it.. but this needs to be said and it is not like that this person has not been given ample time to respond to inquiries...but has chosen not to. The moderator of this HSC has indicated that he is thinking about revising the HSC rules for season 6 but I fear that if action is not taken about this problem then participation will be at a minimum, if at all. If there are any questions..either message me or post them here in this thread. I know that this is supposed to fun.. but fairness has to be a factor in this as well to give EVERYONE equal chance and not be one sided. I rest my case and leave my fate in your hands. Edited by NIKON, Wed Nov 28, 2012 1:56 AM. 1) For the Season 6 and forwards, my suggestion for the moderator is to PUT the specific rules / notes for each game. An example can be found on Dark Chambers, which was played on 7800 HSC - Season 3, Game 15: "Keep moving forward, don't just sit around and kill the bad guys." 2) For the participants who find the special feature which can be considered CHEATING, my suggestion is to POST THE SPECIFIC RULE, mentioning what we CAN'T DO for the specific game. See the example on Room of Doom - played on 2600 HSC - Season 8, Game 8.07 (Post #22 sent by me, OYAMAFAMILY). Example 1: 2600 Donkey Kong - NO PAUSING (You pause the gameplay via letting the controller intact after completing the current level). Example 2: NES Super Mario Bros. 3 (1990), published by Nintendo - see details on Season 5 / Week 6! Example 3: 2600 Beany Bopper - "Pressing SELECT GAME switch at any given time (Beanies pass through any obstacles) is NOT ALLOWED (Post #3 on 2600 HSC, Season 7 / Week 21)." Edited by oyamafamily, Wed Nov 28, 2012 4:46 PM. I'm not sure what to say here... Anyway, I'm gonna show my opinions both on HSC rules and oyamafamily's high scores as well as cheating in general. a) We accept real hardware and emulation, we also accept any kind of controller. This is the stronger and the weaker point of rules. We're inviting anyone to play to together and we are creating an unbalanced tourney. My short answer: I wouldn't change this bc we already have a small team of players. In my case, I possibly wouldn't have 2 imported A7800 if I hadn't start playing with emulators with you all! Well if I started 2 years ago I couldn't take pictures of my wii, I hadn't any digital camera... Now it's easy for me and even easier when I use my pc. c) The honor system and the fun aspect. In such a small community, I think it's a good way to keep running the HSC. I really had much fun with this season. And without prizes, I see no point in cheating but it's always good to keep the integrity of the system so let's talk about uncommon Huge High Scores. a rule) Keep it not bc it's 100% fair, it isn't, but with few players interested in A7800 and considering it's more for fun that's the better way. b rule) Keep it as a general rule, moderator can decide when some proof is necessary to validate some scores on few cases. c rule or philosophy) keep it. Doable in this small community. 2) Oyamafamily's high scores or generaly someone's uncommon high score. And I really don't want to see our honor system abused by cheating. To deal with this difficult situation I always remember I'm playing for fun and I always consider any player a good and fair player if I can't be 100% sure he's cheating. If we go only for high scores as proof we would call Tood Rogers a great cheater. I don't know how he can do what he does in the A2600 . That's why I'm concluding saying oyama's records are fair, good and at the same time incredible. Finally, my opinion about big cheaters (who uses programs to cheat, edit sceenshots, save states, disassemble games etc.). The best is to search for proof and they should be banned from HSC. We must find a strong evidence and then point it asking some explanation. What is and what isn't a proof. Huge scores "per se" isn't enough, great difference between 1st and 2nd place either. Because previous record was 18.40, the exact same time made by me and Jacob this season. So what can explain this coincidence of many better scores (roadrunner, jifremok, jacob past record --- jacob and me in current season) then a better one of 18.24. That's the kind of thing we need to get before anything else. So.... did I get it? Noooo... this particular case may be explained by diferent emulator speed or special hardware. But this is what we should search. Found the best game recording software for Stella users ever! This crap should be common sense. If you are playing for personal fun, cheat away. If you are playing to compare scores, don't cheat. I checked this software out (Bandicam) and it works as advertised...think I am going to start using Bandicam exclusively. I also agree with using common sense. I removed my Desert Falcon scores not because of cheating or foul play...I chose not to participate in that game due to the impossible score posted. I KNOW this game and I KNOW that 1 million points would be this side of impossible to achieve given the parameters set forth by the moderator. To address the emulation...there are many features afforded to the emulator user that is not afforded to the real hardware player...save states..slow down and so forth...controllers are not the issue, that is a matter of personal preference.. real hardware people use modded controllers as well. Again when a score is questionable..I investigate it...most times I keep my findings to myself..but in this case I am compelled to say something because I feel that it has happened more than once this season. To make this fair for everyone..a high score is the ONLY thing we have as proof of a score and it is honor that is required here. I say let the real hardware people speak up here without retaliation and see what they have to say. The difference between PAL and NTSC is a matter of frames per second...and those native to NTSC are already used to the faster speed...doesn't deter from the game through my eyes.I tried playing under PAL settings...could not get anywhere because it was too slow for me. I am not here to split hairs...but to make everyone aware...and give voice to some who are thinking the same way but do not want to speak up. Since this season is all but over...I propose that high scores and records be for that season only and all time records are set in knockout rounds. But that is not up to me..but the moderator...who should be chiming in on this thread as we are looking to our leader for direction. I'd like to echo the remarks made by Liduario. Incredibly high scores do not constitute evidence of cheating, and Todd Rogers is an excellent example of that. Shortly before Twin galaxies went down, I looked up the record for Space Chase and couldn't believe that Rogers had rolled it. I've played the crap out of that game for years and never came remotely close to that kind of score. Oyamafamily has been a well-respected member of the hsc community for years. He has always shown good sportsmanship, is very free with tips, advice, & other information, and congratulates other players on their high scores. He does not seem bent on winning for winning's sake, as he typically does not seek first place for a given season (this season's 7800 hsc being the first exception to that, to my knowledge). He will often post one low score for a game just for the participation point if that game does not interest him. If a game does interest him, then watch out! He's gonna put a great deal of time and energy into mastering the game, as evidenced by a very detailed chart of the Xenophobe floors he created and shared with me. I'm not saying anyone is above suspicion, but we must weigh all the evidence, including a person's conduct over time on these forums. At this point, the greatest crime that can be pinned on Oyama is an obsessive-compulsiveness in performing exceptionally well at specific games that interest him. NIKON/John, I appreciate your efforts to preserve the integrity of the hsc. You're standing up for what you see is right. But I just think more evidence is required before we publicly damage a member's reputation. Kind of late to the party here. Truth be told, I stopped participating for a couple reasons. One of them is the no screenshot allowance. I know you can fake a screenshot, but at least that requires time and effort to doctor up. Then, if the person is bent on doing it everytime a score is better than his/hers, they have to go docotor up the screenshot (risking a mistake and exposure), upload and post it, and then do it over again if that score is topped again. Given the colour differences, etc. they also need to do a whole new layout at the start of every round. Right now someone can say "yeah I got a million and three" and that's it. I'm not saying I suspect cheating, but it started to feel like I was going to a lot of trouble trying to catch a good screenshot, moving the SD card to the computer, shrinking the shot so it fits Atariage's picture limit, and then posting it, knowing the whole time that anyone who wanted to COULD just lie if they felt like it, without even going through half that trouble. I was esentially doing as much work to play legal as someone who was doctoring up a screenshot, but we'd both be going through WAY more work than someone who just wanted to lie. At least a screenshot rigger has to work at their lie. For that reason, I move we require screenshots going forward. I can't think of anyone who can't do that. Not anyone. Your phone has a camera, your digital camera has a camera and video camera, your laptop has a camera, you probably have a $10 webcam kicking around in the garage, your emulator does screenshots, radioshack sells keychain digital cameras for $14.99 that take excellent TV shots, your computer can do print screens, etc. Please, please if you cannot get a screenshot in some way, but are capable of getting on the interwebs, please let me know who you are, magical flying fairy person from the land of unicorns. Again, at least that will make us feel like any cheaters aren't also lazy cheaters. Sounds reasonable to me, Atarifever. I like your keychain digital camera idea. Maybe I'll get one of those for dedicated Atari use, and save my regular digital camera battery power for general photography. Way back in 2004 or 2005 I think I did a couple of weeks of the 2600 HSC. Back then, we didn't have digimaly cameras coming out of every belt buckle and cereal spoon, so I borrowed one of those from my roomate. Even with the technology of 7 years ago, it did the job perfectly fine, and I've seen them in places like Wal-Mart near the candy bars as impulse buys. They may be available cheaper than I even said, and the low res, no flash default mode on the thing took some of the best screenshots I ever got, as it was too dumb to try to fool it up on me by trying to take a picture of the plastic around the screen rather than the screen. Incredibly high scores do not constitute evidence of cheating, and Todd Rogers is an excellent example of that. Shortly before Twin galaxies went down, I looked up the record for Space Chase and couldn't believe that Rogers had rolled it. I've played the crap out of that game for years and never came remotely close to that kind of score. Barnstorming (2600): Todd's record, which stood for many years, was proven to be impossible once we broke down the game code and stripped the stage of any obstacles. With the stage completely blank, flying a straight line to the finish was slower than Todd's record. When we presented this evidence, we were attacked by fans and supporters of Todd, and eventually an excuse was cooked up that I lovingly refer to as "the coffee stain excuse". Yes, after being attacked and told we were clueless about how good Todd was, one of the referees covered for him and claimed the 'document' detailing his record had a coffee stain on the part where the record time was listed. Instead of throwing the record out and forcing Todd to do a legit one on video tape, they just simply adjusted the record to be MAYBE possible by adding a half-second to the time. 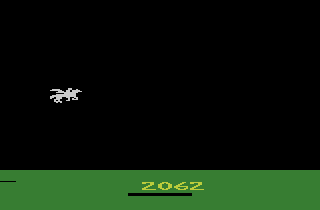 Sky Jinx (2600): Todd's record time for this game also proved to be bogus, and I showed how it was physically impossible when a modified version of the stage that required only 10 banks instead of 16 showed the plane always came in slower than Todd's record. Donkey Kong (2600): Todd's record was entered as 15 million. I immediately suspected it was bogus, since the best results from professionals at the game were well under 1 million. I protested the record and Todd claimed there were full video tapes documenting the marathon session. One of the refs (the same one that came up with the coffee stain excuse) claimed indeed there was a set of tapes. I asked one of the lead referees to investigate and verify these supposed tapes of the records. After several months, the lead ref concluded the tapes never existed and removed Todd's record from the database. I have no information to say whether any of these claims are true, but it'd certainly be easy enough to verify the Barnstorming claim. EDIT: Huh, I guess all this is old news. 1) Q*BERT (7800 B*NQ): I followed the reference rule applicable for Arcade Version - "The use of the trick to cause all enemies to disappear is BANNED". In B*nQ, I kept moving forward to Later Levels because of high bonus points. 2) GALAGA: I took note of the BANNED tactic for this game: "The use of the trick to cause all enemies to stop firing IS BANNED". 3) RAMPAGE / DID DUG: I avoided using Continues. I started the gameplays from a NEW GAME. When I played Dig Dug on 2600 HSC, Season 7 / Week 8 (my first participation in AtariAge HSC), I posted the specific rule for Dig Dug - "Continues are NOT PERMITTED". Where are these rules in the HSC???? These rules are based on Twin Galaxies Official Rules (currently non-operational). I took note of them only for knowledge. Edited by oyamafamily, Sat Dec 1, 2012 2:00 PM. This reminds me of a few years back in the 2600 HSC when we played No Escape! Two or three of us competed for the highest score almost incessantly. I kept one eye on the screen and one eye on the winning score from a previous HSC, which was well into six figures. That game awards points by ones and twos and it has a stiff learning curve, so at first glance it seems impossible to break even 10,000. I was one of the loudest voices that week, claiming that the previous HSC's record was fake. No Escape does, in fact, have a scoring multiplier, but it activates MUCH later than, say, Activision's multipliers do. I activated it that week and realized the ridiculous high score wasn't a fake. I placed in the top three that week with a score that I thought was impossible to attain. I'm with having screenshots required. They're just too easy to get these days to not be included. They help to defend the HSC winner's score. That's where I'd draw the line, though. If this were for prizes or something, I'd recommend gameplay videos, but it's for fun and I think that's where the HSC becomes less fun and more work. And what does this have to do with the 7800 HSC...Oyama look this is about the 7800 HSC...and all its policies and rules...not MAME, arcade, 2600 rules and whatnot. 7800 ports do not have all the bells and whistles of their arcade counterparts. Their simply insn't enough room or processing power in the 7800 for it. I appreciate your information but it just does not apply here. I understand what you are saying...but the game in question here is Atari 7800 Desert Falcon and the rollage of the score on Advanced and Expert settings. Knowing the game as I do and the scoring and game mechanics...scoring over 1 million points given the parameters is impossible. you will see me score over 100K on the first level. Well above the second place participant..but also well short of achieving 1 million points. I removed my scores from the Season 5 Game 17 of the 7800 HSC to remove all bias. I have also attempted many times to get even close to rolling the score...but this game just get faster and more difficult as one progresses...granted there is a ceiling for the enemy speed..but that doesn't hit until the fourth desert. And that is the point where even just moving can get you killed. Edited by NIKON, Sat Dec 1, 2012 4:28 PM. Are you saying impossible due to difficulty (as in my example above) or impossible due to how the game is programmed (such as hitting 1,026,800 in the 2600 version of Megamania)? It sounds like you're saying it's impossible due to difficulty. I though the same thing in that No Escape HSC. That is an impossible game until one learns that they have to move every time the bottom fury throws a stone and the fury's stones will not hit them in horizontal flight. It takes pinpoint timing to avoid being hit. The game is still very difficult after that is learned, but it rewards the player with a large bonus multiplier, which, in turn, makes six digit scores possible. Here's a link to the thread. I all but called the 5th ghost a cheater in post #15. If you read through the entire thread, though, you'll see where I began to understand how he got 7 million points. My own scores improved as I learned the game's timing and I developed some patterns to how I played. I'm no expert with Desert Falcon, or with most of the 7800 library, but let me say again that certain game achievements seem totally impossible until you take time to study how the game (or parts of it) work. We were talking last month about FF7's Ruby Weapon and how it seems impossible to beat until you learn to prevent a certain move by Ruby and also learn that Ruby is particularly vulnerable to a certain spell that doesn't usually do much damage at all. 2. The bonus multiplier..there are three treasures in this game and they all max out at 9 and do not roll over. 4. The skill of the player...after killing the Sphynx at the end of a level the bonus round comes into play..players pick up treasures and are awarded bonus point accordingly..and the players do not lose lives in this round even if they collide with a structure and no enemies appear in this stage. How the bonus round is scored...lets say that the player maxes out the base value at 999 points and has maxed out the multiplier to 9 on all three treasures ( quite a feat if you can do it on expert ) and the player has 30 seconds to pick up treasures which are randomly scattered on the ground and he picks up 10 treasures then the bonus score would be 89,910 points added to the main score. Now this is all ideal conditions..but when you hit a treasure during the level the multiplier reverts back to 1. So what I am saying here is that due to the nature of the game..given the settings...1 million points would be impossible legitimately. I used to be really good at Zaxxon back in the day, good enough to pass many obstacles that required almost pixel perfect flying. I might give Desert Falcon a try. If it's possible to hit a million, I could do it by playing off and on for a month or so. I really don't see a lot of resemblance between the two games beyond the flying part, so I'd need time to work up to a million here. Please don't get me wrong, though. There might be some cheating involved, but I just wanna cover the bases (to satisfy my own curiosity mainly). I've played tons of online games against people who cheat, and I absolutely hate it. I'm touchy about it myself. If I even think I've stumbled on a cheat, I point it out and have my scores pulled. Case in point is Subterranea this week on the 2600. I just stumbled on something that might be considered unfair. I've won the HSC legitimately with that game, but if they think what I've stumbled on makes the game unfair, I won't participate. What I do like, though, is we're hammering out new strategy to these games over 20 years later, and we're still discovering things about them. I appreciate you trying to do this...remember this has to be done in one sitting starting from the beginning...you will soon find out what I have been saying. Speaking about controllers, I always used my QWERTY keyboard when I played the 7800 games on 7800 HSC, Seasons 3, 4, and 5. I used Default Keys on Prosystem Emulator for Controller 1: Arrows to move, Z key for Left Button and X key for Right Button. As always, I used Controller 1 ONLY (SINGLE PLAYER ONLY as a usual rule). The exception occurred on 7800 Robotron 2084: we are playing Robotron 2084 on LYNX HSC 2012 Round-12; there is a Side Challenge - "play an alternate version of Robotron 2084 for a bonus point". When I played the 7800 version of Robotron, I used two controllers (but on the first scores, I used Controller 1 as usual) according to Roadrunner's special note (Roadrunner is the current Moderator on LYNX HSC). Guys, did you know 7800 Robotron 2084 can be played with 2 controllers, even on "1 Player" Mode? Edited by oyamafamily, Sat Dec 8, 2012 5:18 PM.